On October 23rd (the 10th, old style) the Church commemorates the synaxis of the holy Optina elders, and among them the holy elder Ambrose, who died on precisely that day in 1891. 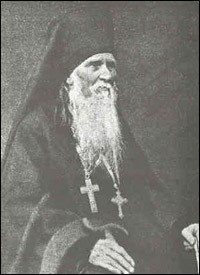 The venerable Ambrose of Optina was born Alexander Grenkov in 1812, in the family of church sacristan Mikhail Grenkov. In his youth, while studying at the Tambov Theological Seminary, Alexander became terribly ill and gave a vow, if he regained his health, to enter a monastery. But becoming well, the lively and sociable youth did not hurry to fulfill his vow. However, new health problems reminded him of his promise, and in 1839 he entered the Optina Hermitage in the Kaluga province, becoming a disciple of the famous elder Leo. From him the young novice gained the experience of the great saints of antiquity in acquiring grace. In 1845 he fell prey to a new and severe illness, which because monk Ambrose’s cross to the end of his life. Soon he began to help the elder Macarius as a confessor, began to see people, to participate in the hermitage’s publishing efforts. After the repose of the elder, hieroschemamonk Macarius, in 1860, St. Ambrose became the brothers’ spiritual advisor. Thousands of believers from all corners of Russia came to the clairvoyant elder for advice. He was visited and engaged in spiritual discussions by the writers Dostoyevsky, Solovyev, Leontyev, Aleksey Tolstoy, Leo Tolstoy… The venerable elder never allowed himself to say a vain or wrathful word, but spoke only for the purpose of correction or spiritual guidance. From the Lord he received the gifts of healing and clairvoyance. Never refusing to help those in need, the holy elder could appear to people who entreated him at a distance, in dreams and face-to-face. He became a great intercessor for the Russian people, having transformed thousands of human destinies by the grace of the Holy Spirit. Saint Ambrose reposed on October 10, 1891 in the Shamordino convent which he had founded. His relics remain at the Optina Hermitage. The elders of the Optina Hermitage gave grace-filled advice to people of all stations in life, including great Russian writers and statesmen. In the 19th – early 20th century the monastery renewed the ancient ladder of eldership, which allowed entire generations of people to ascend into the Heavenly Kingdom. The Optina elders were healers, clairvoyants, comforters, accusers. “The widespread stabs of the young generation at great activity for the benefit of mankind are similar to a person’s not graduating from high school and yet dreaming of becoming a professor in a university… One must first avoid evil himself, and only then concern himself with the benefit of others,” – wrote elder Ambrose at the end of the 19th century. There words, as well as everything that has been said and written by him and other Optina elders, sound extraordinarily applicable to our own times. The elders taught people to live not according to their passions, but according to the commandments. “The zeal which wishes to destroy great evil without appropriate preparation is a great evil in itself,” – said the elder Joseph, a disciple of Saint Ambrose. 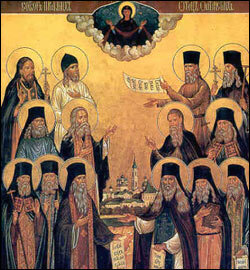 The Optina elders were the defenders and invariable champions of the Orthodox faith. “Apostle Paul writes: ‘I have stayed the course and kept the faith.’ This means that it is a very difficult task… Children, guard the holy faith, which is a priceless treasure, for with it you will enter the Kingdom,” – instructed the elder Barsonuphius. From Optina proud mankind was called to embrace humility. “People are truly losing their minds if they rely on their minds and expect everything from them. Our teacher is humility. God opposes the proud and gives grace to the humble,” – declared the elder Anatoly on the eve of the revolution. The rules of life that were offered to people could be followed in any rank or profession on earth. “Holiness is simplicity, presented to people in a reasonable manner. Good sense is higher than all virtues,” – such was the spiritual testament left us by the last elder, Saint Nectarius, on the eve of his repose in 1928. “How should we live?” – the elder was bombarded from all sides with this universal and highly important question. As was his wont, he responded jokingly: “To live means not to grieve, not to judge anyone, not to offend anyone, and show respect to all.” Such a tone often caused frivolous listeners to smile. But if one ponders this instruction more deeply, one can find in it a profound meaning. “Not to grieve,” i.e. for our hearts not to be burdened with the sorrows and misfortunes that are man’s inevitable lot on earth, but to direct our hearts to the sole source of eternal sweetness – to God; in this manner, even when faced with innumerable and varied misfortunes, man can comfort himself by humbling himself and finding inner peace. “Not to judge,” “not to offend,” – there is nothing more common among men than being judgmental and offensive – those twin offspring of destructive pride. Of themselves they are sufficient to push a man’s soul down to the depths of hell; but, by the way, they are often not even considered to be sins. “Show respect to all” – echoes the apostle’s commandment: to honor each other with dignity and respect (Romans 12:10). Gathering all these ideas into one, we see that in the abovementioned saying the elder primarily preached humility – the basis of spiritual life, the source of all virtues, without which, according to St. John Chrysostome, it is impossible to be saved. “We must, - the elder also said, - live on this earth like a spinning wheel: it slightly touches the earth at only one point, while all the rest tend to go upward; while we lay down on the ground and are unable to get up.” And these instructions, too, urged people to strive to attain humility.